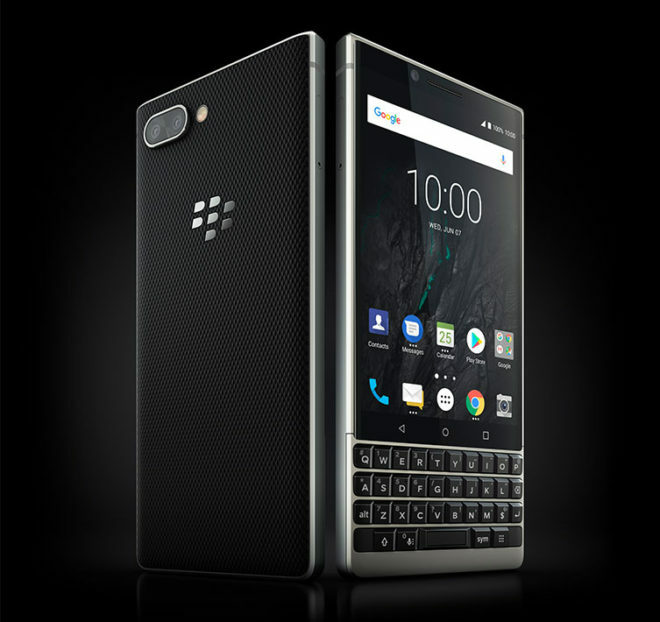 A little more than a year after the launch of the BlackBerry KEYone, a new keyboard-clad BlackBerry phone has arrived. 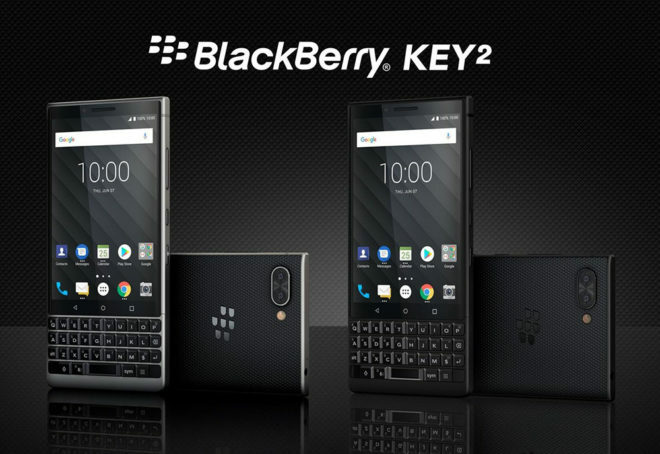 The BlackBerry KEY2 is now official. It’s got some notable upgrades over the KEYone, but the form factor is the same. There’s a 4.5-inch 1620×1080 display with a 3:2 aspect ratio up top, and below that is a physical keyboard with a key height that’s been raised 20 percent and a new matte key finish for a better typing experience. Also of note about the keyboard is that it’s got a new Speed Key that’ll let you access your programmable shortcut keys without having to return to the home screen of your device. And like the KEYone before it, the KEY2 keyboard can be used as a trackpad for scrolling and has a fingerprint reader built into its space bar. Around back is one of the biggest upgrades from the KEYone to the KEY2. There’s a dual rear camera setup on the KEY2, up from the single rear camera on the KEYone. The KEY2 is packing a two 12MP sensors that offer phase detection autofocus along with a 2x optical zoom. BlackBerry has also added in portrait mode so that you can add a blurry background to your photos if you’d like. Inside the KEY2 there are a few other upgrades. An octa-core Snapdragon 660 processor is stuffed in there along with 6GB of RAM — double what was in the KEYone — and 64GB or 128GB of storage. If you need additional storage, you can pop a microSD card into the KEY2. Rounding things out is a 3500mAh battery, USB-C port, 3.5mm headphone jack, a Series 7 aluminum frame, and Android 8.1 Oreo. When it comes to wireless connectivity, the KEY2 includes support for LTE Bands 1, 2, 3, 4, 5, 7, 8, 12, 13, 14, 17, 20, 28, 29, 30, 38, 39, 40, 41, 66. T-Mobile’s LTE Bands 2, 4, 5, 12, and 66 are included in that list, but Band 71 (600MHz) is missing. There’s no word yet on when the BlackBerry KEY2 will launch or which carriers will offer it. So far, all that’s been said is that the KEY2 will begin rolling out globally this month. We do know the price for the BlackBerry KEY2, though, which will be set at $649. It’s competing with devices like the OnePlus 6, and so the KEY2 could be a tough sell to anyone that’s not already a fan of BlackBerry phones and physical keyboards, especially considering the KEY2’s lack of Band 71 LTE support. If you are into BlackBerrys and you long for the feel of physical keys below your thumbs, though, the KEY2 looks to be a nice upgrade over the KEYone. What do you think of the BlackBerry KEY2? Are you thinking about picking one up? Snapdragon 660? 4.5 inch screen? Blackberry should really try and bring back the “Sidekick” days – everybody knows nostalgia is hot right now. Blow that screen up to 5.5 inch and include a spin-out keyboard. Then please, for the love of god, upgrade that processor. After those two things are taken care of, people might start taking Blackberry more seriously. Would get this for work if it was $200 cheaper. The KeyOne is $200 cheaper. Same basic phone. Just last year’s model. it was until I deleted the facebook app. It instantly sped up and is like new again. I wonder if the security software conflicts with FB? It should. The KeyOne does. No Band 71 support. This phone is dead before it even launched. T-Mobile does already carry band 71 enabled phones. Samsung Galaxy S8 Active, Galaxy S9 and S9+, LG G7 ThinQ, LG K30. And you can buy the samsung phones unlocked directly from Samsung. Yes, I am aware that they have band 71 phones. I got my mom an LG K30 recently. But the fact that you just confirmed that most phones they carry don’t even have band 71 should surprise us that an unlocked phone, not carried by TMo doesnt have band 71. I am not aware of any phones only available from third parties with band 71. It is still disapointing but hardly surprising or something that will kill this model. It is being sold for tons of carriers worldwide. The OnePlus 6 has Band 71 and is not sold by T-Mobile. In a year or so, I would imagine most models will. It’s a bummer this one doesn’t. I don’t think it will stop many who otherwise want it. Though since I have a keyone, that is one less reason to upgrade. No 600 mhz band. Would buy if it was available.